5. In the three dimensional view of a silicon N channel MOS transistor shown below, δ = 20 nm. The transistor is of width 1 µm. The depletion width formed at every PN junction is 10 nm. The relative permittivity’s of Si and SiO2 are 11.7 and 3.9 respectively and Ɛ0 = 8.9 X 10-12 F/m. 1. When the optical power incident on a photo diode is 10 µW and the responsivity is 0.8 A/W, the photo current generated (in µA) is ____________. 5. A BJT is biased in forward active mode. 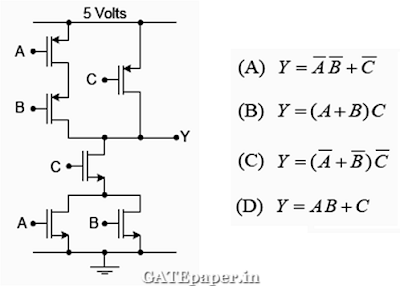 Assume VBE = 0.7 volts, KT/q = 25 mV and reverse saturation current IS = 10-13 Amp. The Transconductance of the BJT (in mA/volt) is…..
7. A depletion type N channel MOSFET is biased in its linear region for use as a voltage controlled resistor. 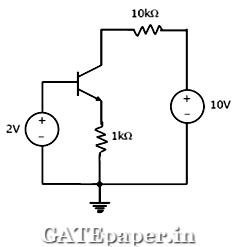 Assume threshold voltage VTH = -0.5 volts, VGS = 2.0 volts, VDS = 5 volts, W/L = 100, Cox = 10-8 F/cm2 and µn = 800 cm2/volt-sec. 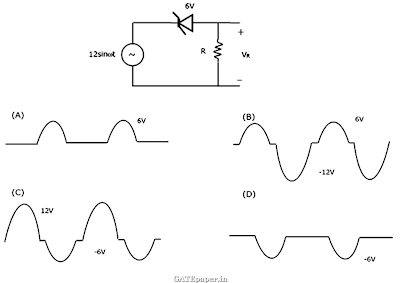 The value of the voltage controlled resistor (in Ω) is …..
4. Assume electron charge q = 1.6 x 10-19C, KT/q = 25 mV and electron mobility µn = 1000 cm2/volt-sec. If the concentration gradient of electrons injected into a P type silicon sample is 1 x 1021 per cm-3, the magnitude of electron diffusion current density (in A/cm2) is …………. 5. Consider an abrupt PN junction (at T = 300oK) shown in the figure. The depletion region width Xn on the N side of the junction is 0.2 µm and the permittivity of silicon (Ԑsi) is 1.044 x 10-12 F/cm. 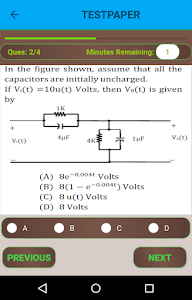 At the junction, the approximate value of the peak electric field (in kV/cm) is………..
4. In the circuit shown, the PNP transistor has |VBE| = 0.7 volts and β = 50. Assume that RB = 100 KΩ. For Vo to be 5 volts, the value of RC (in KΩ) is ……..
6. The slope of the ID vs. VGS curve of an N channel MOSFET in linear region is 10-3 Ω-1 at VDS = 0.1 volts. 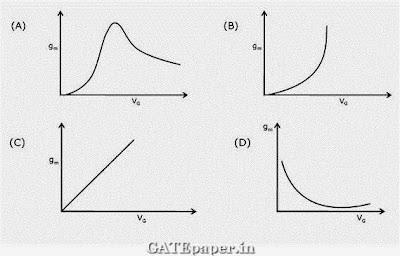 For the same device, neglecting channel length modulation, the slope of the √ID vs. VGS curve (in √A/V) under saturation regime is approximately……………. 7. An ideal MOS capacitor has boron doping concentration of 1015 cm-3 in the substrate. 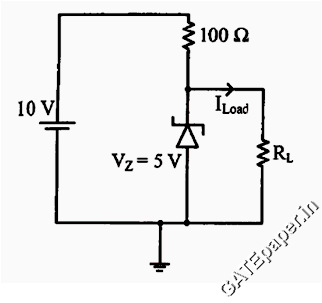 When a gate voltage is applied, a depletion region of width 0.5 µm is formed with a surface (channel) potential of 0.2 volts. Given that Ԑo = 8.854 x 10-14 F/cm and the relative permittivity’s of silicon and silicon dioxide are 12 and 4 respectively. The peak electric field (in V/µm) in the oxide region is ……………..
8. In the circuit shown, the silicon BJT has β = 50. Assume VBE = 0.7 volts and VCEsat = 0.2 volts. Which one of the following statements is correct? 9. 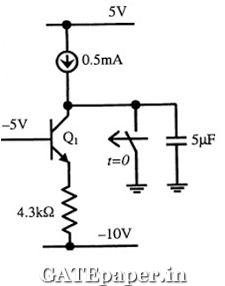 For the MOSFET M1 shown in the figure, assume W/L = 2, VDD = 2.0 volts, µncox = 100 µA/V2 and VTH = 0.5 volts. 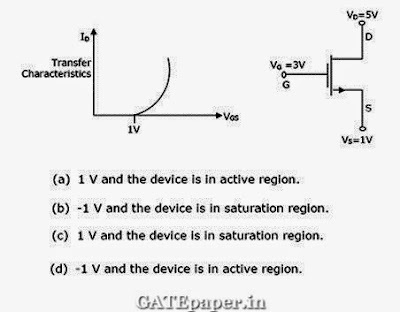 The transistor M1 switches from saturation region to linear region when Vin (in volts) is …………..
3. 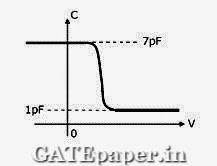 The cutoff wavelength (in µm) of light that can be used for intrinsic excitation of a semiconductor material of band gap Eg = 1.1 eV is …………..
6. 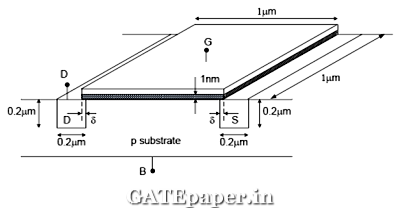 Consider two BJTs biased at the same collector current with area A1 = 0.2 µm x 0.2 µm and A2 = 300 µm x 300 µm. assuming that all other device parameters are identical, KT/q = 26 mV, the intrinsic carrier concentration is 1 x 1010 cm-3, and q = 1.6 x 10-19C, the difference between the base emitter voltages (in mV) of the two BJTs (i.e. VBE1 – VBE2) is ……………. 7. An N type semiconductor having uniform doping is biased as shown in the figure. 8. A BJT in a common base configuration is used to amplify a signal received by a 50Ω antenna. 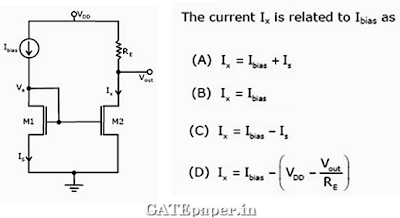 Assume KT/q = 25 mV, the value of collector bias current (in mA) required to match the input impedance of the amplifier to the impedance of the antenna is ……….. 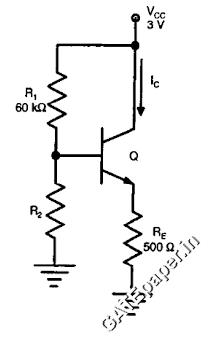 The channel resistance of an N channel JFET is shown below is 600 Ω, when the full channel thickness (tOX) of 10 µm is available for conduction. 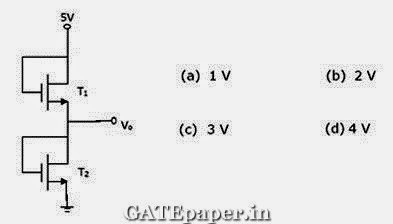 The built in voltage of the gate P+N junction is (Vbi) is -1 volts. 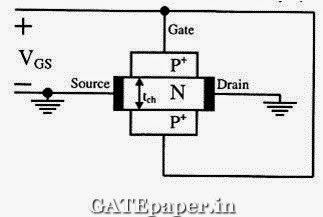 When the gate to source voltage (VGS) is 0 volts, the channel is depleted by 1 µm on each side due to the built in voltage and hence the thickness available for conduction is only 8 µm. 3. 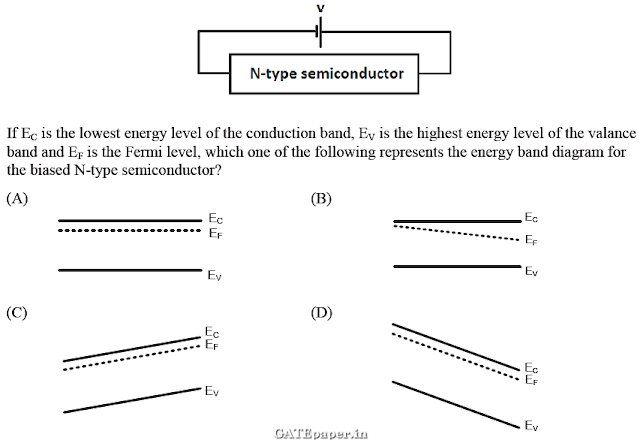 In a uniformly doped BJT, assume that NE, NB and NC are the emitter, base and collector doping in atoms/cm3 respectively. If the emitter injection efficiency of the BJT is close to unity, which of the following conditions is TRUE? 4. Compared to a PN junction with ND=NA=1014 per cm3, which one of the following statements is TRUE for a PN junction with NA=ND=1020 per cm3? 1. In an N type silicon crystal at room temperature, which of the following can have a concentration of 4x1019 cm-3? 5. Consider the following two statements about the internal conditions in an N channel MOSFET operating in the active region. 1. 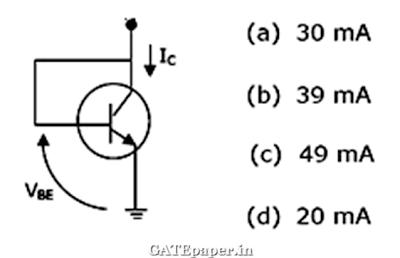 Which of the following is NOT associated with a PN junction? 3. 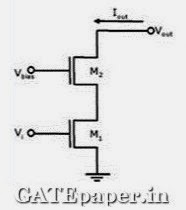 In the following limiter circuit, an input voltage Vi = 10sin100πt applied. 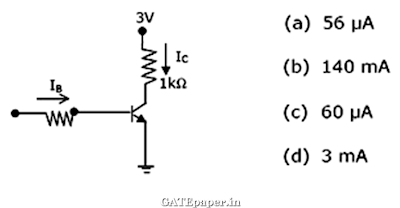 Assume that the diode drop is 0.7 volts when it is forward biased. The zener breakdown voltage is 6.8 volts. 7. The measured Transconductance gm of an NMOS transistor operating in the linear region is plotted against the gate voltage VG at constant drain voltage VD. Which of the following figures represents the expected dependence of gm on VG? 11. Consider the following assertions. S2: For quantum tunneling to occur, a very narrow energy barrier is required. 5. 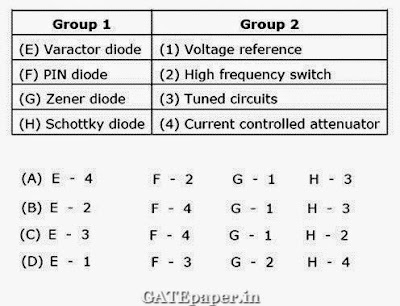 Group I lists four types of PN junction diodes. 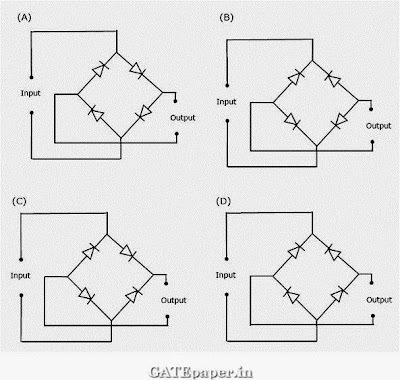 Match each device in Group I with one of the option in Group II to indicate the bias condition of that device in its normal mode of operation. 7. 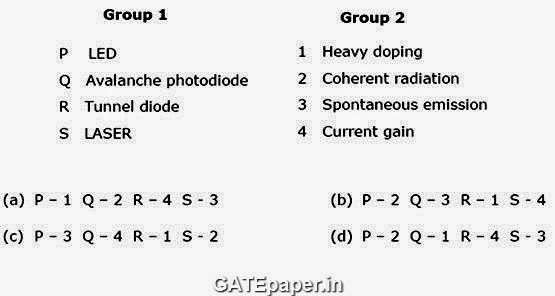 Group I lists four different semiconductor devices. 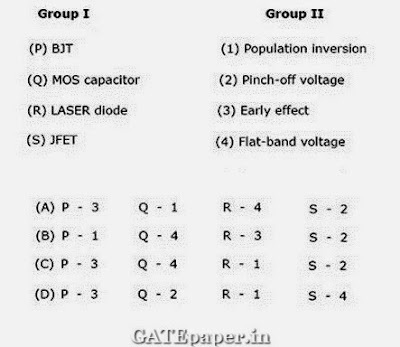 Match each device in Group I with its characteristic property in Group II. 11. The figure shows the high frequency capacitance – voltage (C – V) characteristics of MOS capacitor having an area of 1x10-4 cm2. Assume that the permittivity of silicon and SiO2 are 1x10-12 and 3.5x10-13 F/cm respectively. 3. Consider the following statements S1 and S2. 9. Consider the following statements S1 and S2. 4. Choose proper substitutes for X and Y to make the following statement correct. 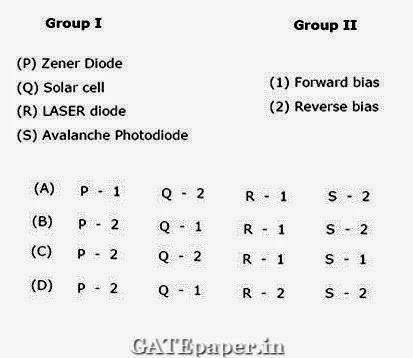 Tunnel diode and Avalanche photo diode are operated in X bias and Y bias respectively.